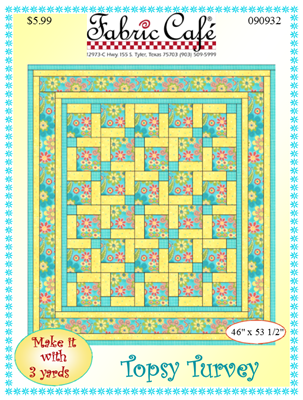 Improve your piecing skills and adding borders. Learn how to chain piece. At the end you will have a finished top to take home. You can then use the skill you learned earlier to finish the quilt yourself or send it to a longarm quilter. You must be comfortable with rotary cutting. Your machine has to be in excellent working order. You need to be comfortable with your machine's features. -Regular sewing supplies - scissors, paper scissors, seam ripper, pins, etc. All supplies are available at Quilting Adventures. We are happy to help you select the appropriate fabrics and supplies for your class and count on your support for this small, locally owned business in order to bring you high quality merchandise and excellent class instruction. As a student, you will receive a 10% discount on all supplies for the class in which you are enrolled. If your class starts at the same time that we open, we will let you into the shop ten minutes before class time. In consideration of other students and employees with allergies, please limit your use of scented personal products when attending one of our classes. If your class calls for a book or pattern, each student needs their own copy of that book or pattern. Under federal copyright law, books and patterns may not be shared. If your class requires a sewing machine, please be sure that you are familiar with its operation, it is in good working order, has been serviced recently, and bring your manual along to class just in case! We do not allow children under the age of 18 in our classes without the consent of the teacher and the shop owner. Only the person who is enrolled and paid for the class may be in the classroom during class time. Out of consideration for the teacher and the other students, please do not bring children, guests, or friends to class with you. Cancellation policy: If the class minimum is not met within seven days prior to the class, it may be cancelled and you will be notified and will receive a full refund. Please keep this possibility in mind when you purchase supplies for your class. No refunds of class fees will be given if student cancels within the one week prior to class.